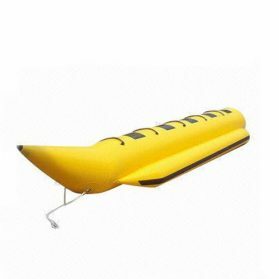 Inflatable banana boat can be widely used as summer water park, water game parks, sun cold paradise amusement water park, for outdoor use, or other entertainments activities and purposes, very exciting. 2. Accessories : D rings at the bottom with strong ropes connecting motor boat, belts used to bind body ,elastic rubber handles ,valves ,pump. 3. Workmanship : Strong and nice welds by advanced welding machine and the best workers. 4. Any colors are available. Logo and style can also be customized. 5. Inflating and deflating : Turn on the electric pump for inflating and turn off it for deflating. of the park are durable eyelets, the structure can make the giant water park connect very stable. so the items can release air to a safety level automatically when the air pressure getting higher. 4) Material: We use best 0.9mm or 0.6mm PVC tarpaulin for water games. strong net inside. The flame retardant meet BS7837. Our material has improved by the SGS. 5) Hot welding machine: For the sealed water game, it is very important for the welding well. We have advanced welding machine and the best workers in inflatable industry. Further more, we make a liquid protecting film on the surface of digital printing. we will paste a mark paper with your order number.